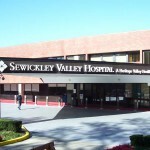 A. Martini & Co. has worked on several projects at Sewickley Valley Hospital, including work at the Staff Station, Obstetrical Department, Angiography/Radiology Department, Patient Rooms, MRI Department, and Pharmacy. At the hospital’s Moon Township location, our team has renovated the Imaging Center and performed work on the parking lot and entrance canopy. Additionally the Main Lobby canopy and, most recently, major renovations to the 7th Floor West Wing were completed.